Tangled and True: click clack moo. 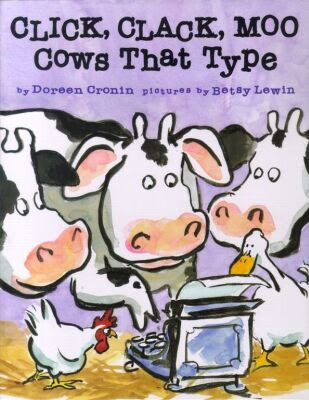 One of our all time favorite books, Click Clack Moo by Doreen Cronin. It's been a favorite for Lily since she was two, and Stella has recently discovered a love for this humorous story about cows and hens. Too funny. We read this for bed time just last night. rachel, we have that one too and the girls love it just as much. they are really fun books. These books are going to be the free toy in Chick-fil-a kids' meals during June/July (depending on your location). I can't wait! You should hear it read (with typewriter sound effects) on Weekend Editon.